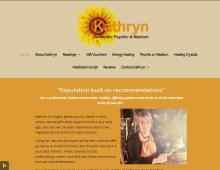 Kathryn is a talented psychic in Kent, UK. Her natural talents as a clairvoyant were discovered from a young age and she has always had a passion for helping people. With over 20 years experience she is well known for some of the best psychic readings in the UK. Telephone psychics like Kathryn can help with relationships, well-being, anxiety and confidence. Kathryn offers her telephone reading service up and down the country from Hampshire and Surrey to London and Kent. Kathryn also holds one to one psychic readings in Kent. If you are looking for a professional psychic in Kent to deliver your telephone reading or provide spiritual healing, then contact Kathryn today!